Sleep deprivation, or insufficient sleep, leads to sleep debt (also called sleep deficit), which is characterized by mental, emotional and physical fatigue, and problems in effectively performing day-to-day activities, particularly the high-level cognitive functions that are carried out in the frontal regions of the brain. Sleep debt tends to accumulate: about two weeks of less than 6 hours sleep a night reduces alertness and performance to a level equivalent to a full 24 hours of sleep deprivation; a week of only four hours sleep a night is equivalent to 2-3 days without any sleep; etc. Daytime performance continues to worsen as the sleep debt builds up, although it is still not clear up to what point. Unfortunately, one of the effects of sleep deprivation is impaired judgement, so that (similar to the effects of alcohol) we usually do not notice, or may even subconsciously deny, the extent of our reduced alertness and functionality. Typically, we may be aware of the effects of sleep debt in its early stages, but our perception of our level of alertness tends to level off as a period of sleep deprivation continues, even though the impairment in performance continues to worsen. Sleep deprivation has major effects on the homeostatic regulation of sleep, but only minor effects (if any) on the circadian pacemaker. After a period of sleep deprivation, our bodies naturally try to make up for lost time (known as “rebound sleep“), but not all stages of sleep are made up the same. On the first night of sleep following a period of deprivation, priority is naturally given to making up restorative deep slow-wave non-REM sleep, mainly to restore our physical functions by secreting more growth hormone and other proteins, and repairing the immune system. Only after these essential body functions have been performed is REM sleep extended on subsequent nights. It should be noted, though, that, on a long-term basis, sleeping in at weekends does not appear to be sufficient to cancel out the accumulated sleep debt of a week of bad sleep. Interestingly, people who regularly sleep longer hours (“long-sleepers”) do not tend to get much extra slow-wave sleep and only a little extra REM sleep compared to those who sleep shorter hours, the extra time being spent mainly in relatively light non-REM sleep. 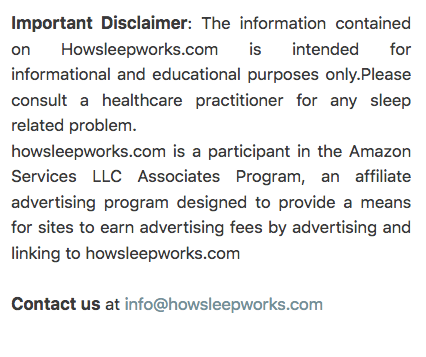 So, it could be argued that people who naturally sleep less actually have a higher concentration of deep slow wave sleep. As most people will have experienced personally, even one hour sleep a night less than the optimal amount takes a toll on our mood, energy and our ability to handle stress. Insufficient sleep typically manifests itself in a whole array of physiological and behavioural effects including: yawning, reduced alertness, a diminished ability to concentrate and multitask, reduced attention span, memory lapses, impaired reaction time and reflexes, aching muscles and muscle fatigue, hand tremors, dark circles or bags under the eyes, lowered body temperature, increased blood pressure, increased stress hormone levels, increased heart rate variability, mood swings, irritable or aggressive behaviour, confusion, increased risk-taking and poor decision-making, and even hallucinations. In the longer term, sleep debt has been associated with a whole host of serious and even potentially life-threatening conditions, including an increased risk of obesity, type II diabetes, fibromyalgia, psychosis, depression, bipolar disorder, stroke, heart attack, impaired immune function, and high blood pressure, among others. A few examples of how this works may be instructive. 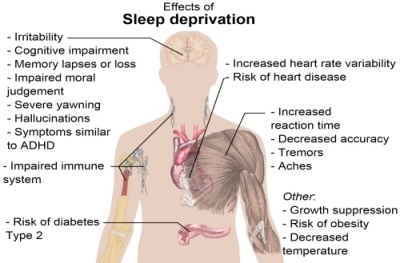 Sleep deprivation has been shown to alter the balance of hormones such as leptin and ghrelin that regulate appetite, leading to overeating, higher glucose levels and insulin resistance, all of which are risk factors for type II diabetes. It is thought that, without enough sleep, our bodies may get “stuck” in a state of alertness, leading to an increase in the production of stress hormones, which increases blood pressure. 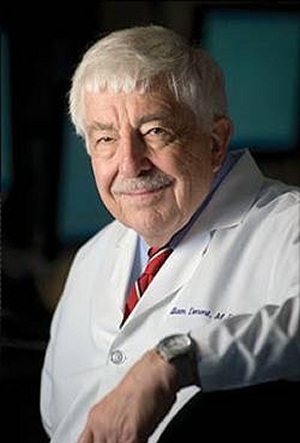 A recent study linking insomnia with the protein orexin and the peptide amyloid beta has led to the suggestion that Alzheimer’s Disease may be connected with chronic sleep debt. There is also some evidence that some types of cancers may be linked with sleep debt (for example, women who sleep more than 9 hours a night have been shown to have significantly lower breast cancer rates than those who sleep less). Lack of sleep may be the hidden cause behind many, or even most, of the “human error” that causes so many accidents each year. The sleep debt accumulated by shift workers makes them particularly vulnerable to accidents and injuries, and it is no coincidence that many high-profile industrial and transportation accidents (e.g. Exxon Valdez, Chernobyl, Bhopal, Three Mile Island, etc) occurred at night. The risk of accidents in general is estimated to be about 30% higher on night shifts than on day shifts, with the risk increasing with the duration of the shift and the number of consecutive night shifts worked. Road accidents provide another stark example of the effects of sleep debt. 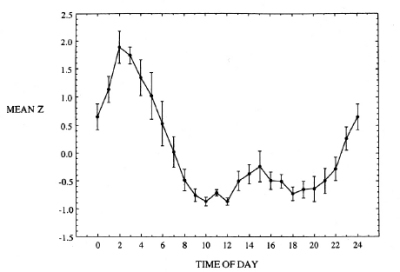 Most research suggests that road traffic accidents show a huge skew towards the nighttime hours, peaking around 2-3am (the time of most profound sleepiness in the daily circadian rhythm), with another smaller peak in the mid-afternoon (coinciding with the post-lunch dip, a natural dip in the circadian alerting system). Up to 60% of Americans say they have driven while sleepy within the last year, and 37% admit to having actually fallen asleep at the wheel. The National Highway Safety Administration estimates that falling asleep while driving is responsible for around 100,000 accidents each year in the USA alone, including 71,000 injuries and over 1,500 deaths. In fact, an estimated one-fifth of all road accidents can be attributed to drowsiness, and it is possible that even this is an underestimation. Something as small as the one-hour shift to daylight-saving time each spring has been associated with a 20% increase in vehicle accidents on the following Monday. To put this into perspective, drowsiness kills or seriously injures about twice as many people in road accidents as do drugs, and about one-third of the road accidents attributable to alcohol. In fact, as they affect driving, the effects of sleep deprivation are actually very similar to those of alcohol, but more difficult to diagnose/detect. It has been estimated that 17 hours of sustained wakefulness (for example, from 7am until 12 midnight) leads to a decrease in performance equivalent to a blood alcohol level of 0.05% (two glasses of wine), the legal drink driving limit in many countries. One study has shown that preschoolers who get insufficient sleep are twice as likely to use alcohol, tobacco and drugs during their teenage years. Also, some 40%-70% of confirmed alcoholics report sleep disorders of various sorts. However, in making these kinds of claims, it is notoriously difficult to separate out cause and effect, especially when one considers that psychiatric disorders such as depression, bipolar disorder and alcoholism may often lead to sleep difficulties, rather than – or indeed as well as – vice versa. The oft-quoted evidence that sleep positively promotes longevity (or at least that less-than-optimal sleep shortens lives) is similarly inconclusive. More than one study has suggested that people who sleep between seven and eight hours a day tend to live longer, and that those who sleep for either shorter (six or less hours) or longer (more than nine hours) periods each day tend to have shorter lives, although it is possible that other factors such as depression, cancer-related fatigue and socioeconomic status may also be involved, and the studies are not considered definitive. One study, reported in the peer-reviewed scientific journal Sleep in 2010, concluded that six or less hours of sleep was associated with a 12% increased risk of death, but nine or more hours was linked with a 30% increase. A few studies have associated daytime naps with lowered blood pressure, reduced cardiovascular stress and reduced coronary mortality, although it is not clear whether the beneficial effects arise from the actual sleeping or from merely the expectation of relaxation (or from other associated lifestyle effects). Perhaps less surprisingly, people (especially women) who reported using sleep medications show a substantially elevated risk of early death. What seems clear, though, is that extreme sleep deprivation ultimately leads to death. Studies on laboratory rats in the 1980s (and confirmed in more rigorous tests in 2002) have indicated that complete sleep deprivation leads to a gradual drop in body temperature, break-outs of sores and lesions (as the immune system breaks down), crazed and violent behaviour, and ultimately death within as little as two to three weeks. 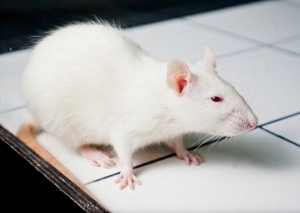 Interestingly, the rats’ organs after death appeared to be largely intact, and they seem to have died from sepsis or just “exhaustion” – no unambiguous cause of death could be identified. A rare sleep disorder in humans called fatal familial insomnia (FFI), in which the sufferer gradually completely loses the ability to sleep, is, as the name suggests, fatal, although it is still far from clear exactly what causes the death. However, another similar (and even rarer and even less understood) disorder called Morwan’s syndrome also leads to severe sleep disruption but without ending in death. Mysteriously, sufferers from this disease may go for months with no sleep, and yet exhibit no obvious mood or memory disorders, and not even any feelings of sleepiness. The only really striking symptom is a dream-like state of vivid hallucinations, lasting around an hour, that hits each night. An individual’s ability to deal with sleep deprivation may well be genetic to some extent. It has been found that 10%-20% of the population have a mutation in a particular gene such that they experience a particularly strong homeostatic drive to sleep. Such a person may be much less likely to develop insomnia than the average person, but equally they may have much more difficulty coping with sleep deprivation, working a job that requires shift-work, etc. Sleep deprivation has even been used as an interrogation technique (including by the US military, which officially sanctions up to 7.5 days at a time of sleep deprivation as an interrogation tool), despite its clear breach of the UN Convention Against Torture. There have been many examples of voluntary sleep deprivation which have allowed us to see its effects on the body and the mind. The pioneering American sleep researcher William C. Dement himself went without sleep for 48 hours, and reported feelings of suspicion and paranoia, as well as vision problems and increased clumsiness. Peter Tripp, a New York disc jockey stayed awake for a week as a charity fundraising stunt in 1959. He soon began to suffer from hallucinations, and eventually developed symptoms of full-blown paranoia. A 17 year old Californian, Randy Gardner, went without sleep for 264 hours (11 days) for a bet in 1964, and currently holds the official scientifically-documented record for intentional sleeplessness without the use of stimulants, although British consciousness researcher Tony Right is also recorded as having achieved 11 days of sleeplessness in 2007, using a special raw food diet of his own devising. Guinness World Records (which no longer includes sleep deprivation records due to the possible health risks) has in the past listed the Finn Toimi Soini as having gone without sleep for 276 hours in 1964, and a British woman, Maureen Weston, as having stayed awake for 449 hours (almost 19 days) in 1977, but these are not considered to be scientifically documented. There have been other much more extreme claims, although with no scientific or independent validation, such as the Vietnamese farmer Thai Ngoc who claimed in 2006 not to have slept at all for 33 years, or the Ukrainian Fyodor Nesterchuck who claimed not to have slept for over 20 years, but these have mainly turned out to have been either exaggerated or falsified. For the record, a few studies have also looked at the effects of extending sleep. For instance, students who normally slept about 7.5 hours a night were able to increased their sleep time to 9 or even 10 hours for about a week when asked to sleep “as much as possible”, and their alertness, reaction time and cognitive performance improved during this time (suggesting that they were sleep deprived before). However, over the longer term, their total sleep time fell back to around 8.5 hours, suggesting that this was a more natural and sustainable sleep period. Other studies of extended sleep have even shown a reduced sensitivity to pain as one of the benefits. On the other hand, long-term excessive sleep has also been associated with an increased risk of mortality from various causes, although generally to a lesser degree than with sleep debt, and the underlying causes are much less apparent.